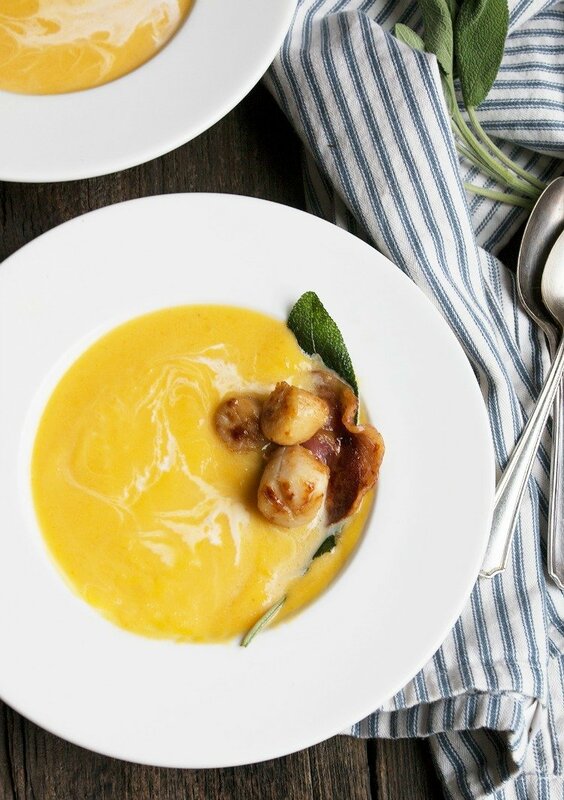 By simply adding crispy, salty pancetta rounds, some beautifully seared scallops and fried sage, you can elevate your every-day soup to super special status. You can make the soup ahead and refrigerate. When ready to serve, simply re-heat, thinning with a bit more chicken stock if needed. The pancetta crisps, sage and scallops are best cooked up just before serving. This can be done easily in a few minutes while the soup is re-heating. Roast the squash: Preheat oven to 375°F (190C). Cut the squash in half lengthwise. Using a spoon, scoop out and discard the seeds and dark orange stringy flesh. Place the squash cut side down onto a baking sheet, using a baking sheet that allows the squash to lay completely flat. Use two baking sheets if necessary and rotate their position in the oven halfway through roasting. Roast squash in pre-heated oven for 60-70 minutes or until very soft when you press on the top of the squash. Remove squash from oven. INCREASE OVEN TEMPERATURE TO 425F (220C). Using a spatula, flip the squash halves over and allow to cool a few minutes. Using a spoon, scoop all the roasted squash flesh out and into a bowl, being careful not to take any of the skin. Discard squash skins. Measure out the amount of cooked squash needed for this recipe and set aside. Any extra squash can be refrigerated or frozen and used for another purpose. For the soup: In a large soup pot or Dutch oven, melt butter over medium heat. Add diced onion and cook, stirring, until onion has softened and is translucent, but not browned. Add the measured roasted squash, shredded apple, salt and pepper. Add the chicken stock and stir to combine well. Bring to a light boil over medium-high heat, stirring occasionally, then reduce heat to medium-low and allow to simmer, uncovered, for 20-30 minutes to blend the flavours. While soup is simmering, place pancetta rounds onto a baking sheet and bake in preheated 425F oven until just crispy, about 7-8 minutes. Remove to a paper towel. For the sage, in a small skillet, heat the oil over medium-high heat until very hot. Add the sage leaves and allow to cook 15-20 seconds, turning once. Do not allow to brown, as it will become bitter. Remove to a cooling rack. Using an immersion blender (or alternately in small batches in a blender) puree the soup well until completely smooth. In the soup pot, add the heavy cream to the pureed soup. Stir well to combine and allow to cook over medium-low heat a few minutes to warm through. Taste soup. Add additional salt as needed and some freshly ground pepper. You don’t want to be skimpy with the salt! Salting well is the key to bringing out all the great flavours in this soup. Finally, cook the scallops. Heat the butter and olive oil in a skillet over medium-high heat until very hot. Dry the scallops with a paper towel then season with salt and pepper. Add scallops to skillet, leaving room in between. Let cook, undisturbed for 1 minute per side for small scallops up to 1 1/2 minutes per side for larger scallops or until golden. Remove to a plate. To serve: Spoon warm soup into shallow bowls. Place a sage leave on the side. Place 3 small scallops onto a pancetta crisp and place over the sage leaf. Add a few drops of heavy cream to the soup. Contributor: Jennifer Malone from Seasons and Suppers.